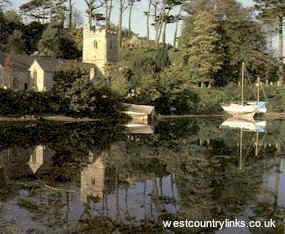 No where is more luxuriant than St.Just-In -Roseland, where a small 13th-15th century church perches on the waters edge at the head of a wooded tidal creek. Across the peninsula is the small fishing village of Portscatho with its small fishing boats, mainly for shellfish. An old military road runs down to St.Antony Head here you can see an old unused lighthouse built in 1834. The Roseland peninsula is renowned for its beauty with woodlands and creeks to the north-west and rocky cliffs to the south -east with the Percuil River meandering down the centre.